THE BAY The Series Press: MICHAEL FAIRMAN - ON AIR | ON SOAPS: Daytime Favorite John Reilly Added to the Cast of THE BAY! MICHAEL FAIRMAN - ON AIR | ON SOAPS: Daytime Favorite John Reilly Added to the Cast of THE BAY! 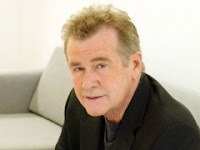 Best known for his role as Sean Donnely on ABC’s General Hospital, The Bay has cast soap veteran John Reilly in the recurring role of Mortimer, the Garrett butler.